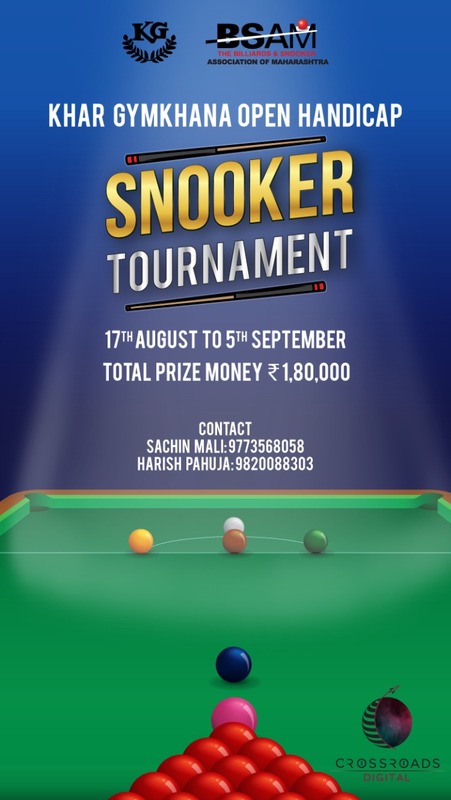 Khar Gymkhana Open Handicap Snooker Tournament 2018. Players registration is mandatory for all participating in this event. The Tournament committee will review the handicaps after round 1 and then after round 3 wherever applicable. All participants must wear a collared T shirt with Trousers / Normal Jeans (Not Torn) with socks and proper Shoes OR formal clothing for their matches i.e a formal shirt, formal trousers, socks and formal shoes. Any participant who does NOT adhere to the above dress code will NOT be permited to play their match. All the draws and the match schedules will be put up on the website www.bsam.in well in advance. The draws will also be put up at the Khar Gymkhana . All participants must check the website for their schedule match time and date well in advance. All participants must report for their match 15 minutes before their scheduled time. No participant will be notified of their matches... they need to CHECK the same on the above website.Matches once scheduled will NOT be adjusted.